Trout Stats: Tessa is 163 mm (6.42 inches) in length & currently weighs in at 45.3 grams (1.6 ozs). We are Scott Blair’s parents and we could not be more proud of the work that Scott, Dr. Fox and others are doing to help preserve nature within Peterborough. It’s fun to think that Scott knew little about fish 12 years ago, and now he is working to save the Brook Trout fish habitat. 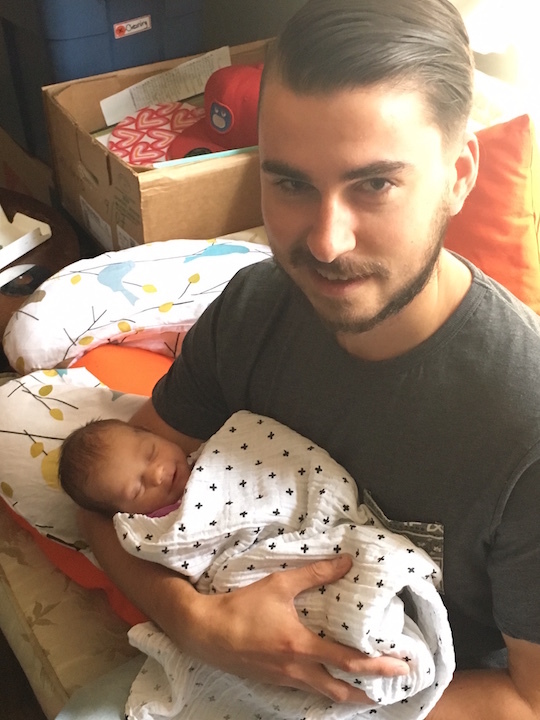 Scott Blair, lead researcher, holds his new born niece, Tessa. We named our fish Tessa as just before Scott started tagging the trout, his big sister had her first child and named her Tessa. We though it fitting to name our trout Tessa as it is a new life and a new beginning, maybe for the Brook Trout too. The story behind fish #4, Tessa, highlights the benefits of family closeness and caring. But unlike Scott and his niece Tessa, Tessa (the trout) will not benefit from parental care. In fact, Tessa (the trout) is lucky her parents didn’t eat her! As a newly hatched brook trout, Tessa emerged to a competitive world where fitness seemingly depends on the individual – or does it? For wild animals, there are different types of fitness, and for our trout Tessa, fitness equated to survival through the first winter. The more Tessa grew in the first year, the better the odds of living to reproduce. So what does this have to do with family? The key is in the need to survive and grow, and any activity that steals energy away from that strategy impacts the ultimate goal. Behaviours such as predator avoidance and fighting to protect feeding territory are the types of activities Tessa would want to minimize. This is where kinship becomes important, and inclusive fitness becomes a more attractive option than individual fitness. While Tessa may squabble with her siblings, choosing to hang out with family brings out far less aggressive tendencies in comparison to a stranger swimming into your space. Because fighting could result in an injury, and excessive movement in the water might be picked up by the sharp eyes of a winged predator, keeping a low profile is a better strategy. Research has shown that brook trout may favour a form of inclusive fitness where reducing competition improves the chance of survival. But how does Tessa recognized siblings? 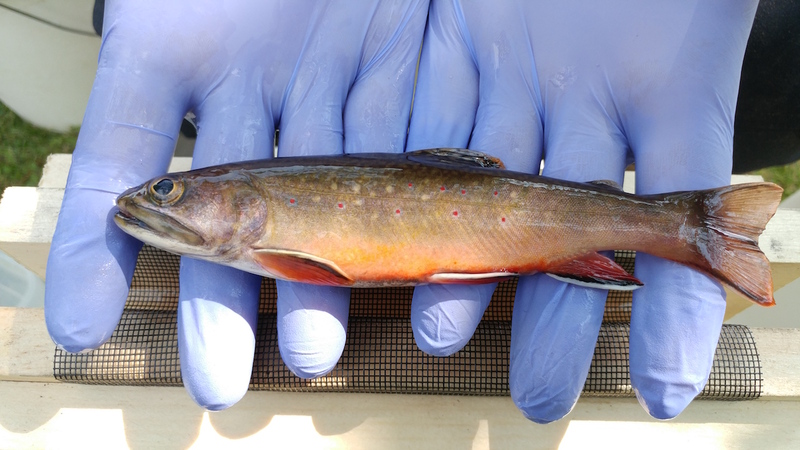 This is where it gets interesting as researchers observe juvenile brook trout preference for family members, and try to unravel the cues that allow them to discriminate between kin and non-kin fish of the same species. Some hypotheses point to chemosensory detection, either through smell or taste (Keefe and Winn 1991). Digging into the origin of odours and flavours, Rajakaruna et al. (2006) discovered a correlation between the presence in stream water of a molecule related to immune responses, Major Histocompatibility Complex (MHC), and an observable behavioural preference for kin. MHC is related to the compatibility of tissues, for example the acceptance or rejection of skin grafts – makes sense that if you are related enough to receive an organ donation, you might be family! Researchers Hiscock and Brown (2000) also noted that ‘home stream’ water that is more concentrated with faeces and urine from increased numbers of trout, was preferred by isolated individuals under stress in laboratory conditions. A possible hypothesis for the attraction to concentration was the ‘safety in numbers’ theory, and the ability of the group to detect predators more quickly. Thus, while we may not know exactly how trout recognize their relatives, or which survival strategies are used by Tessa and the other Harper Creek brook trout, one thing that science has made clear: Family Matters! Hiscock, M. J. and J. A. Brown. 2000. Kin discrimination in juvenile brook trout (Salvelinus fontinalis) and the effect of odour concentration on kin preferences. Can. J. Zool. 78: 278-282. Keefe, M. and H. E. Winn. 1991. Chemosensory attraction to home stream water and conspecifics by native brook trout, Salvelinus fontinalis, from two Southern New England streams. Can. J. Fish. Aqua. Sci., 48: 938-945. Rajakaruna, R.S., A. Brown, K. H. Kaukinen and K. M. Miller. 2006. Major histocompatibility complex and kin discrimination in Atlantic salmon and brook trout. Molecular Ecology 15: 4569-4575.